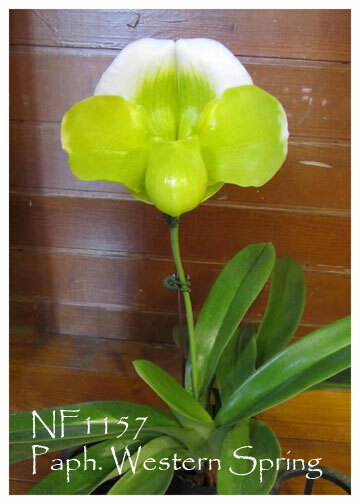 A superb combination of two breeding lines for the newest in complex green Paphs ! Paph. Tommie Hanes comes from California with Paph. Mem. Toshiomme Miyata hailing from Japan’s breeding programs. The result has been large waxy flowers with broad chartreuse green petals and pouch, all accented by a bold white dorsal sepal heavily flushed with chartreuse green, leaving a nicely contrasting broad white margin. Great compact spikes make for the perfect presentation of its flowers. Highly Recommended !